GREENFIELD — As talks of finding additional beds for the city’s homeless fizzled this summer, questions grew about what exactly would happen this winter to these people, many of whom were evicted from a Greenfield Common encampment under political pressure in the fall. 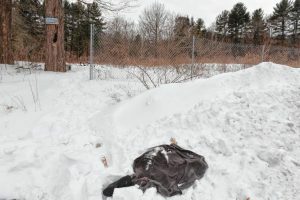 The death of two people found in a tent in the woods behind the McDonald’s on the Mohawk Trail in Greenfield Monday has renewed the conversation about how to sustainably care for the city’s homeless population that some advocates are now measuring at up to 200 people. An additional 14 beds on the second floor of the 60 Wells St. ServiceNet overnight shelter remain in political and financial limbo. Discussions Wednesday, before a vigil on the Greenfield Common to honor Clayton “Aaron” Wheeler and a woman known locally as “Kathy,” ServiceNet and the Massachusetts Department of Housing and Community Development were on different pages about who had the next move. The estimated cost for second floor shelter beds came in around $144,000 by an architect, who determined the facility has to be upgraded to meet code for a shelter. Currently, ServiceNet is about $94,000 short of being able to begin work on opening the additional beds. 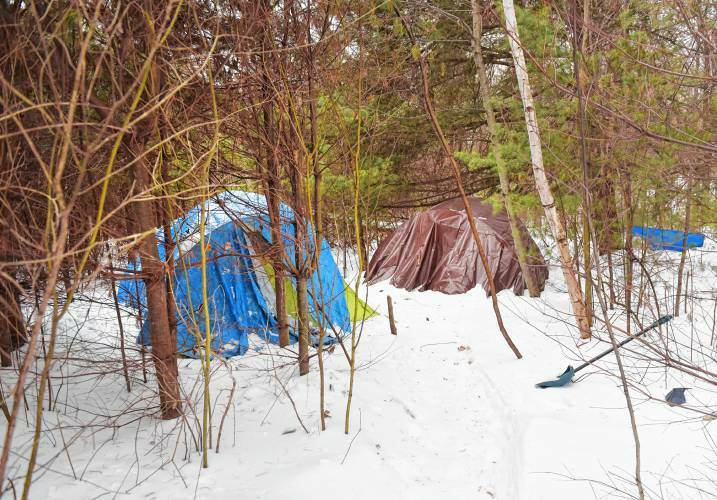 After the homeless “tent city” on the Common was shut down, Mayor William Martin pledged to earmark about $50,000 of Community Development grant money to opening a new shelter. When this was first announced, and before an architect’s review of the space, it was believed by city officials and advocates that the money would be enough to renovate the space in the immediate future. Tents pitched behind the fast food restaurants at the Rotary in Greenfield. They hoped it would be open for this winter, but when estimates came in too high to use just the city’s money, ServiceNet turned to the state for assistance. In an October letter from the state, a roughly $51,000 pledge was made toward the operational costs of a three-month emergency shelter. It costs about $30 a night, per bed, per person, according to ServiceNet’s Jay Sacchetti, senior vice president of shelter and housing, vocational, and addiction services. While the state money may cover the operational costs, and the city’s money can cover $50,000 of renovation, that still leaves ServiceNet with about half of the total bill to front. A DHCD spokesperson said there has been no discussion about covering the remaining renovation cost, while ServiceNet said there had been talks on the state potentially covering that cost. ServiceNet’s Wells Street shelter currently can accommodate 20 people; in emergency weather capacity can swell with people sleeping on couches or chairs. 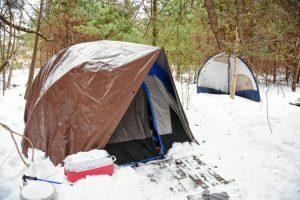 There are about 30 people on the wait list currently, Sacchetti said, although the social workers will check in with those on the wait list during emergency weather situations to see if they at least have a couch to stay on in the extreme weather, which can be when the temperature falls into the teens. He said they will not turn away people when they need a place to stay in this type of weather. 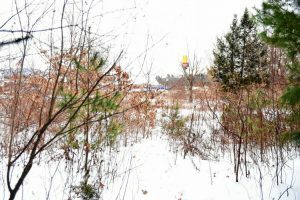 Wheeler had been offered a place to stay on Friday, Sacchetti said, but he chose to stay at the homeless campsite off the Mohawk Trail. He said he’s not sure if additional beds, given the current wait list, could have changed the outcome of the situation leading to the death of two individuals. 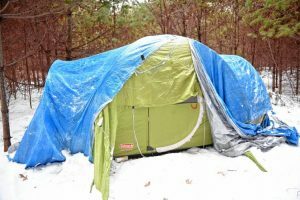 There has been a 14 percent rise in homelessness in this past year in Massachusetts, he said, which Sacchetti said was the highest climb in the country. In a rural area, there are particular challenges with affordable housing, including transportation and access to jobs. For the City of Greenfield, administrator MJ Adams, the lead on these endeavors, said Wednesday they are continuing to work to find affordable housing opportunities and increase shelter beds. There are currently talks with Greenfield Housing Authorities, Inc., the city housing authority’s nonprofit arm, to try to find single-room occupancy opportunities — potentially in the old Clinical & Support Options building on High Street. “I think what happened on the Common this summer really heightened people’s awareness for housing issues for people on the low end of the housing situation,” Adams said. Adams also noted the “significant population in recovery,” which possess its own challenges. The city’s first sober house for women is beginning to open its doors after years in the making. City Council President Karen “Rudy” Renaud called for an emergency City Council meeting for this Tuesday to address the situation. The council will take up an ordinance for a “freeze ban,” which is still being drafted, intended to lower some hurdles that may currently exist to give people more places they can stay in extreme weather.